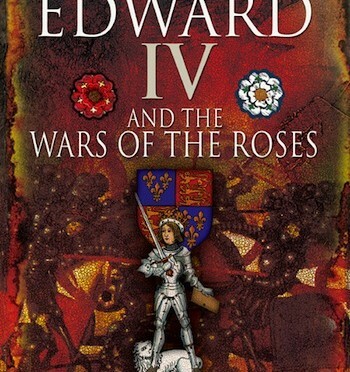 Edward IV and the Wars of the Roses. Author: David Santiuste; Pen and Sword Military: ISBN 978 184884 5497. This softback edition has 146 pages with a further 45 of abbreviations, notes and bibliography. 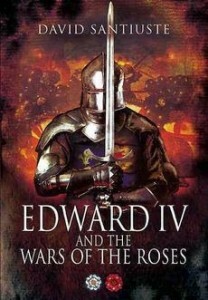 This is not a full biography of Edward IV. It is more a reassessment of his military career and role as a commander. By the author’s own admission, it is not based on extensive archival research of his own. The notes, however, suggest reliance on some of the most prominent experts of the period, notably the late Professor Charles Ross, in conjunction with more contemporary research. Helpfully, it does include a family tree, which is necessary because of the complex family connections of most of the main players; the importance of which cannot be underestimated. Having looked up David Santiuste (a tutor at Edinburgh University) on the internet, it is clear to me that although this work is constructed in a solidly academic style, he intended this book to also appeal to a more general readership. To modern thinking, most of the battles in the Wars of the Roses would only be classified as skirmishes. It must, however be remembered that the population of the country at this time was in the region of 2,500,000 and therefore the pool of men to fight was limited, especially as this was effectively civil war and the combatants split between the two sides. 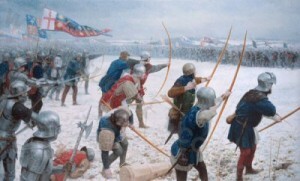 David Santiuste suggests that events at the Battle of Northampton (1460) which was Edward’s first command in the absence of his father, may have influenced his later strategic conduct; although it is likely that Warwick had overall command. 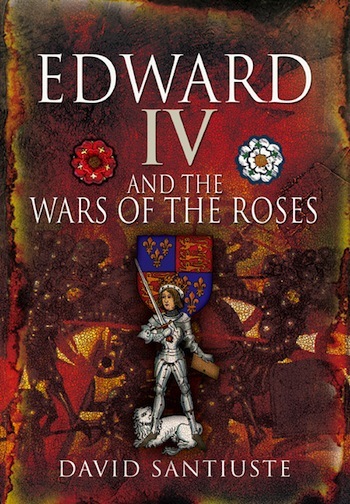 The author asserts that Edward’s leadership qualities stem from his great height and personal charisma, even as an 18 year old. The battle of Mortimer’s Cross (1461) was Edward’s first personally crucial battle and like many more, the outcome was heavily influenced by the weather. The rare phenomenon of parhelia (the apparition of three suns caused by refraction of sunlight through ice crystals) was seen before the battle and Edward convinced his frightened men that this was a good omen, representing the Holy Trinity. Surely quick thinking on his part, as this would have bolstered the morale of a frightened body of men. People in the Middle Ages were very superstitious and believed strongly in omens of this sort. The fact is that Edward’s great height of some 6ft 4” must have made him very noticeable. To men seeing him in the thick of the fighting would have been a great encouragement. Mr Santiuste quotes from the leading commentators of the time and even Edward’s detractors all admit to his fine stature and good looks. No bad thing for a medieval king who had to take the crown in battle and then demonstrate strength enough to rule. 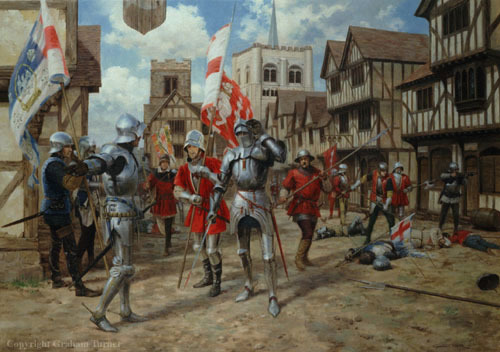 Edward was not present at the second battle of St Albans, which followed hard on his victory at Mortimer’s Cross. Warwick was comprehensively defeated at this encounter and I think it true to say that he may have been a better sailor than a soldier. The author suggests that Edward was already seeing that his destiny lay in his own hands and he already ‘no longer bowed to Warwick’. In spite of this defeat, the Yorkists gained control of London because the city denied access to the Lancastrians. This has much to do with the fact that the Lancastrian armies of the period developed a reputation for plunder and savagery towards the general populace. Edward, on the other hand, was noted for his strict discipline, commanding ‘that no man in his own army should act thus, on pain of death’. Then came probably the most important battle of this first part of the civil war and bloodiest ever fought on English soil; Towton. This represented a decisive Yorkist victory, which resulted in Edward’s confirmation as king, followed by his coronation. The butcher’s bill of Towton has been the subject of much speculation for many years and is inevitably discussed in this work, with the author attempting to rationalise the claims of the chroniclers of the period with the more recent archaeological evidence, concluding that whatever the final figures were, the armies of both sides would have been as large as possible (bearing in mind the losses suffered in recent battles) because the outcome of this battle would confirm the crown on Edward or Henry. This book does not deal with the personal, more salacious side of Edward’s character. Although the issue of Edward’s marriage is briefly mentioned, the author develops the many reasons for Warwick’s disaffection with Edward’s regime. It is too easy to simply blame the marriage. Edward was clearly a very able sovereign and in fact, his choice of bride was the final realisation to the Earl of Warwick that Edward was his own man and wasn’t going to be ‘guided’ by the earl on all main issues. I think it likely that the breach with Warwick was inevitable as he probably believed he would be the power behind the throne – no matter who the king married. The author then goes on to describe the events resulting in the final disintegration of their relationship, which ultimately resulted in the alliance of Edward’s treacherous brother George with the earl and his tactical withdrawal to the Low Countries to regroup. Had the king not done this, it would have surely resulted in the loss of his head, never mind what turned out to be the temporary loss of his throne. Mr Santiuste details Edward’s time in Bruges and eventual persuasion of his brother-in-law, Charles the Bold to lend him the resources to mount an invasion to regain his crown. Edward landed at Ravenspur at the mouth of the Humber on March 2nd 1471, cleverly suggesting that he had only come to claim his rights as the Duke of York, but quickly gathered an army and with remarkable speed regained London; the Lancastrian lords abandoning Henry VI to his fate. Edward’s supporters had soon rallied and rearmed and the Yorkists were able to give battle at Barnet on April 14th, Easter Sunday 1471. A remarkable turn around, which resulted in the death of the Earl of Warwick, finally breaking Neville power. George of Clarence had turned his coat again and now Edward went on to fight his final battle at Tewkesbury, resulting in the death of Henry VI’s heir and most of the Lancastrian hierarchy. Those that survived went into exile. Only then did he order the death of Henry VI, probably belatedly realising that while ever he lived, he would be a focus for rebellion. The second period of Edward’s reign was marked by peace as there was now no viable threat to his regime. Probably the most controversial event was the Treaty of Picquigny (1475). 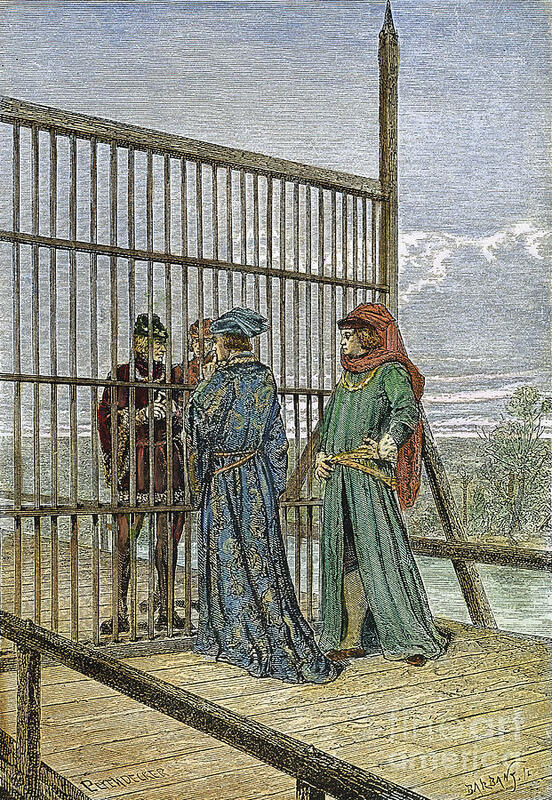 Edward took an army to France, but agreed the treaty with Louis XI on the bridge at Picquigny, which paid a pension to Edward of 50,000 crowns per annum with a down payment of 75,000. This continued for seven years, until Louis reneged on the agreement. This represents millions at today’s values and Edward probably regarded it as his finest hour, thereby avoiding a costly war and supplementing the exchequer. His remaining brother, Richard however, did not. This event may mark the beginnings of his disaffection with the king, while remaining a loyal lieutenant. Edward IV is a much ignored king who school history books write off as a tyrannical despot. Yet this is surely not so. David Santiuste describes a man who time and again tried to rehabilitate his enemies, with varying success. His patience with the treachery of his brother George is a good example of this. History has shown that he was the victor of this conflict and an undefeated general. When Edward died unexpectedly in 1483, he was personally rich and the exchequer was full. 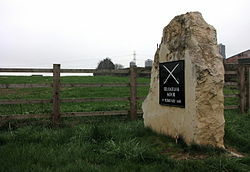 The four battles of Mortimer’s Cross, Towton, Barnet and Tewkesbury are among the most important to English history. This book gives full accounts of them all, with details of weapons, tactics and the logistical difficulties that a medieval army would face. The book also includes three maps; one a general map showing the locations of all the battles and two more detailed ones, covering Towton and Tewkesbury. I would have liked to see two more to cover Mortimer’s Cross and Barnet and find myself wondering why these weren’t included. 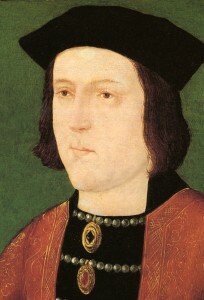 Recently Professor Saul David has described Edward IV as one of history’s most ‘overrated’ people. David Santiuste’s work demonstrates that Edward’s record as a commander and leader of men equals the more accepted warrior princes of the Hundred Years War. This is a comparatively short work, but the author has been careful not to be distracted from his main theme, while placing Edward’s actions in the context of his policies, both at home and in a wider Europe. A worthwhile read. What is the connection between the unusual officer holder of a Plantagenet Local Goverment Position, the Second Battle of Lincoln and Utah Beach in Normandy? The answer is a woman, Nicholaa de la Haye. 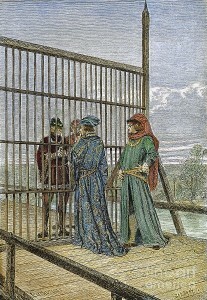 Chatelaine of Lincoln Castle and Sherriff of Lincoln, described by the anonymous contemporary French Chronicler from Bethune as a “very cunning, bad hearted and vigorous old woman” Nicholaa was a remarkable medieval woman who played a significant part in the Second Battle of Lincoln, 20 May 1217, the turning point of the First Barons War. Nicholaa de la Haye is thought to have been born between 1150 and 1155 into a Lincolnshire family which claims to have owned the Barony of Brattlesby since pre Norman times. Nicholaa outlived two husbands, William FitzEmeis, who died in c. 1178, and Gerard de Camville, who died in c. 1215. The closing months of King John’s reign and the opening years of King Henry III’s minority not only saw her directing the royalist defence of Lincoln castle against the supporters of the French Prince Louis but also saw he created sheriff of the county of Lincoln. (1) The story of Robin Hood, and its villain the Sherrif of Nottingham gives an insight into the life of a Plantagenet local government official. Nicholaa was involved in seizing land from rebels and taking and moving hostages. However she might be described in heroic terms by the Royal party as the manful defender”, she was King John’s servant and carrying out some of his dirty work. Nicholaa de-La-Haye was a benefactor of Castle Acre Priory in Norfolk. The De La Haye Family took its name from La Haye-du-Puits in the Manche department on the Cotentin peninsular. Her second husband Gerard de Camville had commanded King Richard’s fleet and his family name was from an area near la Haye-du-Puits. Nicholaa’s family inheritance included land in Poupeville and Varreville in Normandy, on what would be the rear exits from Utah Beach. The lands in France were ultimately settled to Nicholaa’s sister Julia and her husband, which may have removed the potential for conflicting loyalties as King John had lost Normandy to the king of France in 1204. 20 May is the 797th anniversary of the second Battle of Lincoln. which was fought around Lincoln Castle on 20th May 1217. The battle was fought between the forces of the future Louis VIII of France and those of King Henry III of England, in what is known as the First Baron’s War. This conflict lasted from 1215-17 and arose in the aftermath of the signing of Magna Carta. King John repudiated the Carta and the Barons invited Prince Louis to England to depose King John. After the death of John ion October 1216, his faction fought in the name of the infant King Henry III. By May 1217 the French forces were as far North as Lincoln. Lincoln Castle itself was held for the Royalist party by Nicholaa de la Haye. Illustration of the Battle of Lincoln. thought to show the death of the Compte de Peche. Louis’ forces were attacked by a relief force under the command of William Marshal, 1st Earl of Pembroke. One of the most famous soldiers of his day. The Comte du Perche, commanding the French troops, was killed and this heavy defeat led to Louis being expelled from his base in the southeast of England. This event is known as “Lincoln Fair” after the looting that took place afterwards. The citizens were loyal to Louis so Henry’s forces sacked the city, which was regarded as being pro rebel. Lincoln Castle is still preserved and as the site of one of the extant copies of Magna Carta. For more information on visiting the battlefield of Lincoln, and other sites from the Barons’ wars contact British Battlefields. PD D Thesis by Louise Jane Wilkinson Thirteenth Century Women in Lincolnshire. 14th May 2014 is the 750th anniversary of the Battle of Lewes, a key event in the Barons wars, which resulted, in the cocmmitment of the Kings of England to abide by the Magna Carta signed just under fifty years earlier. The Battle of Lewes was one of two main battles of the conflict known as the Second Barons’ War. It took place at Lewes in Sussex, on 14 May 1264. It marked the high point of the career of Simon de Montfort, 6th Earl of Leicester, and made him the “uncrowned King of England”. 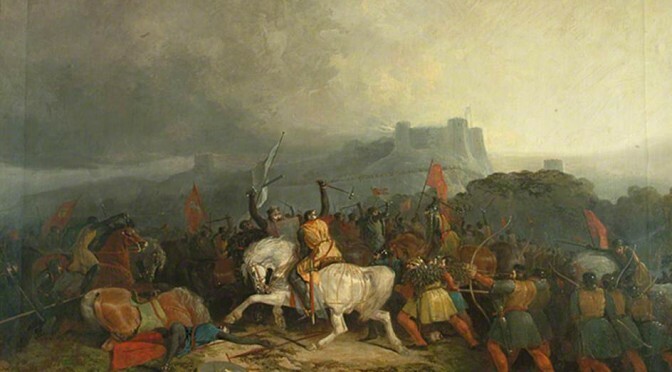 Henry III left the safety of Lewes Castle and St. Pancras Priory to engage the Barons in battle and was initially successful, his son Prince Edward routing part of the Baronial army with a cavalry charge. However Edward pursued his quarry off the battlefield and left Henry’s men exposed. Henry was forced to launch an infantry attack up Offham Hill where he was defeated by the Barons’ men, defending the hilltop. The royalists fled back to the castle and priory and the King was forced to sign the Mise of Lewes, ceding many of his powers to Montfort. King Henry III, in his efforts to subdue the reforms springing from the Provisions of Oxford of 1258, provoked a baronial faction led by Simon de Montfort, Earl of Leicester, to the extent that civil war as only a matter of time. Simon de Montfort and the baronial army marched on the King at Lewes and positioned themselves on the crest of the Downs to the north-west of the town. The King’s foot soldiers followed the cavalry under Prince Edward up the long hill, but were pushed right back against the Castle and Priory in the town. The royal army suffered significant casualties, several leading supporters of the King had fled, and much of the town was ablaze. The only near contemporary account is from one William of Rishanger. Chronicle of William de Rishanger of the Barons’ Wars ed. J.O.Halliwell (Camden Society 1840). Here in the English Heritage Battlefield report. Earl Simon passed that night without sleep, giving time, as was his habit, to divine offices and prayers and exhorting his men to make sincere confessions. Walter de Cantilupe, Bishop of Worcester, absolved them all, and commanded that for the remission of their sins they should manfully strive for justice on that day, promising to all who should die thus the entry into the heavenly kingdom. Battle being therefore certain, at daybreak before the rising of the sun, they went out from the village of Fletching, where a great part of them had spent the night, and which was about ten miles from Lewes. Before the start earl Simon de Montfort girt Gilbert de Clare with a knight’s sword. When they had marched near the town of Lewes and were hardly two miles distant from it, Simon with his men ascended a hill and placed his chariot there in the middle of his baggage, and having purposely placed and firmly erected his standard upon it, he encircled it with many armed men. Then with his own forces he held the ground on either side and awaited the issue of events. In the chariot he set four London citizens, who a little before, when he passed the night in Southwark, had conspired to betray him. This he did as a warning. When he had thus prudently arrayed his forces, he ordered white crosses to be sewn on their backs and breasts over their armour, so that they should be distinguished from their enemies, and to indicate that they were fighting for justice. At dawn the baronial army suddenly attacked the king’s guards who had gone out to seek for food or fodder and killed many of them. When the king therefore was sure of the coming of the barons, he soon advanced with his men, with his standards unfurled and preceded by the royal banner, portending the judgment of death, which they call the ‘Dragon’. His army was divided into three parts: the first line was commanded by Edward, the king’s eldest son, together with William de Valance, earl of Pembroke, and John de Warenne, earl of Surrey and Sussex; the second by the king of Germany with his son Henry; and the third by king Henry himself. The baronial forces were divided into four, of which the first line was given to Henry de Montfort, the second to Gilbert de Clare together with John FitzJohn, and William of Montchensy; in the third were the Londoners under Nicholas Segrave; while the earl himself with Thomas of Pelveston led the fourth. Then Edward with his line rushed on his enemies with such violence that he compelled them to retreat, and many of them, to the number of sixty knights, it is said, were overwhelmed. Soon the Londoners were routed, for Edward thirsted for their blood because they had insulted his mother, and he chased them for four miles, slaughtering them most grievously. But through his absence the strength of the royalists was considerably diminished. Meanwhile many of the might men of the royal army, seeing the earl’s standard on the hill and thinking he was there, made their way thither and unexpectedly slew those London citizens, for they did not know that they were on their own side. In the meantime the earl and Gilbert de Clare were by no means inactive, for they smote, threw down and killed those who opposed them, endeavouring with the utmost eagerness to take the king alive. Therefore many of the king’s supporters rushed together – John earl of Warenne, William de Valance, Guy de Lusignan, all the king’s half brothers, Hugh Bigod and about three hundred warriors – and seeing the fierceness of the barons, fled. There were captured Richard, the king of Germany, Robert Bruce and John Comyn, who had led the Scots thither. Also King Henry had his horse wounded under him, and giving himself up to earl Simon was soon brought under guard to the priory. There were killed on that day many Scottish barons, and a great number of the foot soldiers who came with them had their throats cut. Meanwhile Humphrey de Bohun earl of Hereford, John FitzAlan earl of Arundel, William Bardolf, Robert de Tateshale, Roger de Somery, Henry Percy and Philip Basset were taken prisoner. But on the king’s side there fell the justiciar, William of Wilton and Fulk FitzWarin, the one slain by a sword, the other drowned in the river. On the barons’ side fell Ralph Haringod, baron, and William Blund the earl’s standard bearer. On both sides five thousand are said to have fallen. When Edward and those fighting with him returned from the slaughter of the Londoners, not knowing what had happened to his father, he went round the town and came to Lewes castle. When he did not find his father there, he went to Lewes priory, where he found his father and learned what had happened. Meanwhile the barons made an assault on the castle, but as those shut up in it defended themselves manfully, the barons withdrew. When Edward saw their boldness within the castle, he was greatly inspirited, and collecting his men again, he wished to continue the battle afresh. Discovering this the barons sent arbitrators of peace, promising that they wished to treat for an effectual peace the next day. 490 years ago, Pierre Terrail, seigneur de Bayard, the commander of the French rear guard at the Battle of the Sesia, was mortally wounded by an arquebus ball, on 30th April 1524. This French soldier, generally known as Chevalier de Bayard, was renowned by his contemporaries as the fearless and faultless knight (le chevalier sans peur et sans reproche). He himself preferred to be referred to as “le bon chevalier”, or “the good knight”. The death of a man famed for his chivalry at the hands of an anonymous arquibussier appear to symbolise a transition in warfare. 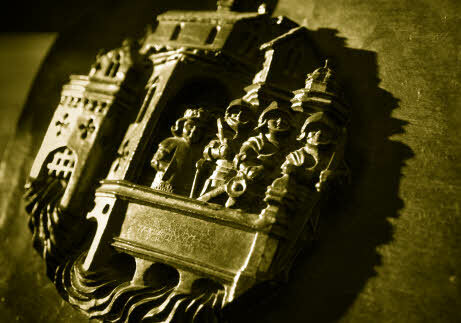 However the Bon Chevalier was much more than just a symbol. While most of his military services was in Italy and the borders of France, there are parts of his story which touches British Military history. 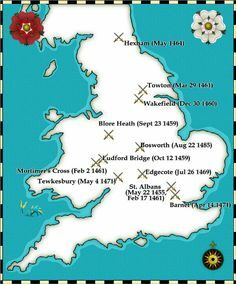 From the insular Britain the reign of the Tudors is fairly peaceful, fgive or take the odd Scottish incursion or Yorkist plot. But the forty years from 1490 was a turbulent time in Europe, with France at war for most of the time with Spain and the Holy Roman Empire was fought in Italy and along France’s still ill defined boundaries. This was a period when military technology, organisation and tactics were changing rapidly. 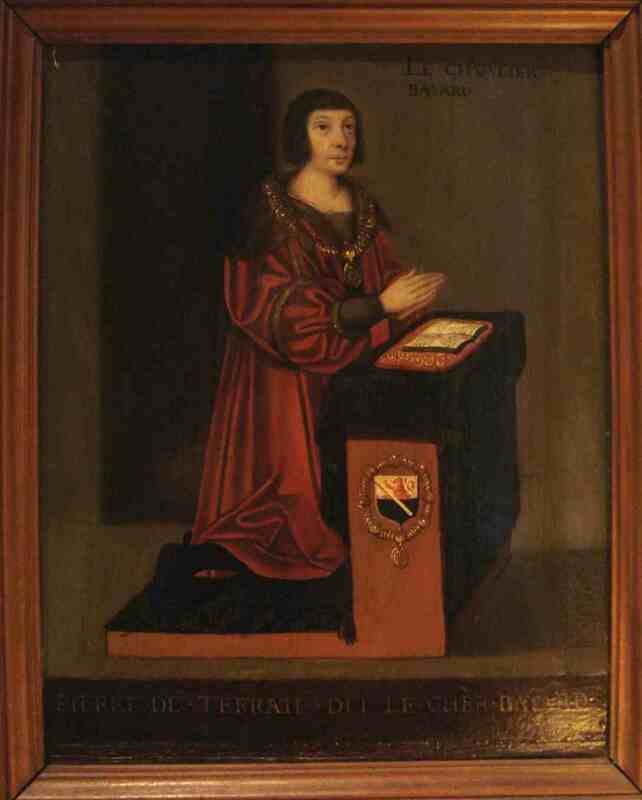 The wikipedia entry on Chevalier de Bayard lists his military service over thirty years service for three successive French monarchs Charles VII, Louis XII and Francis I mainly in Italy but also in Flanders. He seems to have played an important role in many of the battles of the Italian wars, from Charles’ ,VII’s campaigns . In 1503 the re was a battle on the line of , with the Spanish Army assaulted the French Army across the the River Garigliano, via bridges of boats. 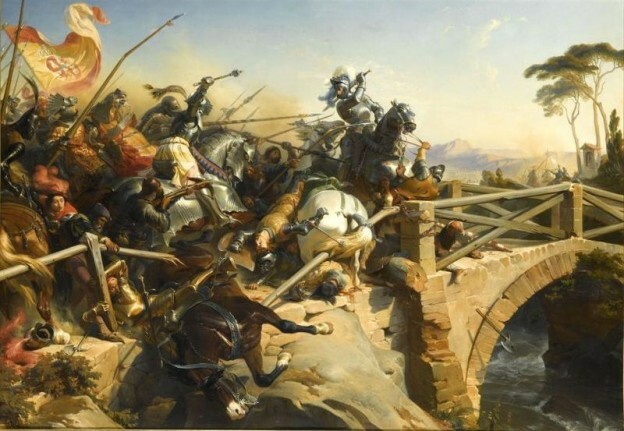 One of the more famous incidents of the battle is the single handed defence of a bridge over the Chevalier de Bayard single handed held off a force of 300 Spaniards. This took place close to the village of Minturno, close to where the British Army attacked in a similar fashion in January 1944 and a few hundred metres from the Commonwealth War Cemetery. Ten years later Bayard fought at the battle of Guines, known by the English as the battle of the Spurs, in which a French cavalry force was defeated by the English. Fleeing from the field Bayard was trapped, but noticing an English knight un-armoured and resting he forced the man to yield and then in turn offered himself as a prisoner. This act of chivalry endeared him to Henry VIII who released him on parole. That is an interesting view from a historic figure at a time which we assume is dominated by treachery, Machaivelli and mercenaries. To visit the battlefields of Chevalier de Bayard contact mus! 23 APRIL 2014 – ST GEORGES DAY MILLENIAL: FOR GOD, IRELAND AND KING BRIAN BORU! Here is a thought. The most important battle to take place on St Georges Day in the British Isles is a great part of irish history, and own which might have shaped the fate of England too..
Today, 23 April 2014 is the millennium of the battle of Clontarf a key battle that shaped Irish history, and may have had implications for the British Isles. 23 April 2014 is the 1000th anniversary of the Battle of Clontarf north of Dublin between the Irish forces forces of Brian Boru, high king of Ireland, and a Viking-Irish alliance comprising the forces of Sigtrygg Silkbeard, king of Dublin, Máel Mórda mac Murchada, king of Leinster, and a Viking contingent led by Sigurd of Orkney, and Brodir of Mann. It lasted from sunrise to sunset, and ended in a rout of the Viking and Leinster forces. Brian was killed in the course of the battle, as were his son Murchad, and his grandson Toirdelbach. After the battle, the Vikings of Dublin were reduced to a secondary power. Brian’s family was temporarily eclipsed, and there was no undisputed high king of Ireland until the late 12th century. 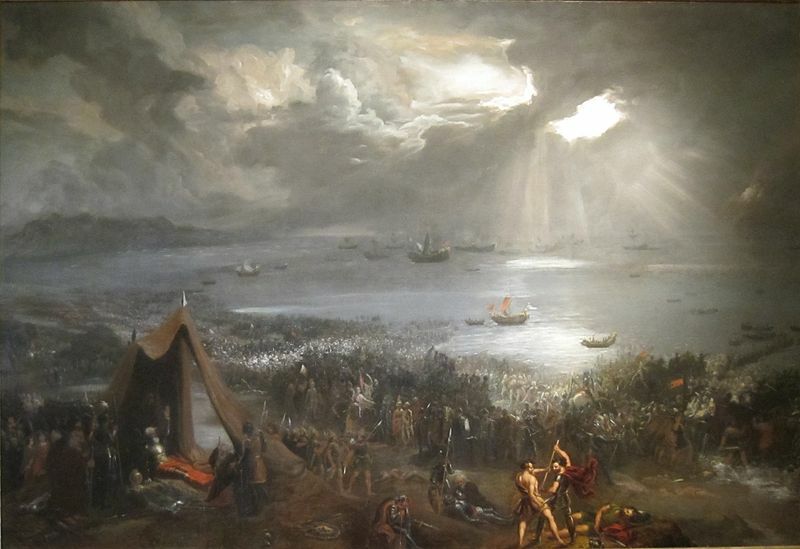 There is a lot more on the battle of Clontarf on wikipedia and the official Clontarf web site. There is the same media focus on “new claims” about the battle that exists in England over Hastings. In the case of this report in the Irish Independent this case it is whether the accounts a of the battle were taken from the Iliad. Would a Viking victory in 1014 have made a difference to the future political shape of the British Isles. Might a powerful Dublin have been an actor in the struggle for England in 1066? Could the most important event to affect English history to take place on St George’s Day have taken place in Dublin? 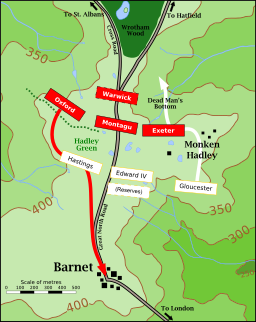 This battle on 19 February 1408 was the final battle in the Percy Rebellion of 1402 –1408, against the usurper King of England, King Henry IV. This was Percy’s third revolt. He gathered together an army of lowland Scots and loyal Northumbrians and marching south once more toward York. At Bramham Moor, south of Wetherby, his army was met by a force of local Yorkshire levies and noble retinues which had been hastily assembled to meet the force, led by the High Sheriff of Yorkshire Sir Thomas Rokeby. Percy’s army was defeated and he was killed. The battlefield is not on the battlefield register and is under threat from encroachment. The Battle of Towton is claimed to be the largest and longest battle fought on British soil. Towton was of huge significant in both military and social terms. The battlefield is also a key location for the study of battlefield conservation. It is a highly significant archaeological site, revealing evidence of both the arrow storm and the bodies of some of those killed. The extent of the artefacts around this registered battlefield places it at risk from a range of threats. The visit will be an excellent opportunity to see how the local battlefield society has developed and presented the interpretation of the battle. 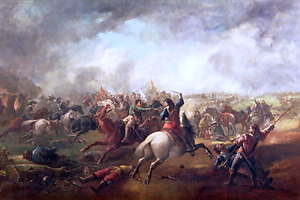 This English Civil War battle is a registered battlefield lying within the boundary of the city of Leeds. It is under threat from encroachment by development. The Earl of Newcastle, the Royalist Commander, was marching on Bradford (which was Parliamentarian in sympathy) with 10,000 men. Fairfax, the Parliamentary commander, had 3,000-4,000 men in Bradford. However, despite his inferior numbers, Fairfax came to intercept the Royalist army as Bradford was ill-prepared to resist a siege. The strong Royalists defeated the Parliamentarians. The battle was significant as it consolidated Royalist control of Yorkshire. 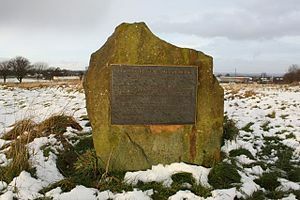 The combined forces of the English Parliamentarians under Lord Fairfax and the Earl of Manchester and the Scottish Covenanters under the Earl of Leven defeated the Royalists commanded by Prince Rupert of the Rhine and the Marquess of Newcastle. This battle is one of the decisive actions of the war, resulting in the Royalists abandoning the North. The battlefield is on the English Heritage register, and has been under threat from metal detecting. One of the land owners is the Trust’s local representative on the battlefield. 2.00-5.00pm To the battlefields of Adwalton Moor (1643) and Bramham Moor (1408) guided by Frank Baldwin the Chairman of the Battlefields Trust. Car RV outside the the Holiday Inn Hotel at 1.30 p.m. – Option to Pick up individuals at Leeds Railway Station at 14.00. 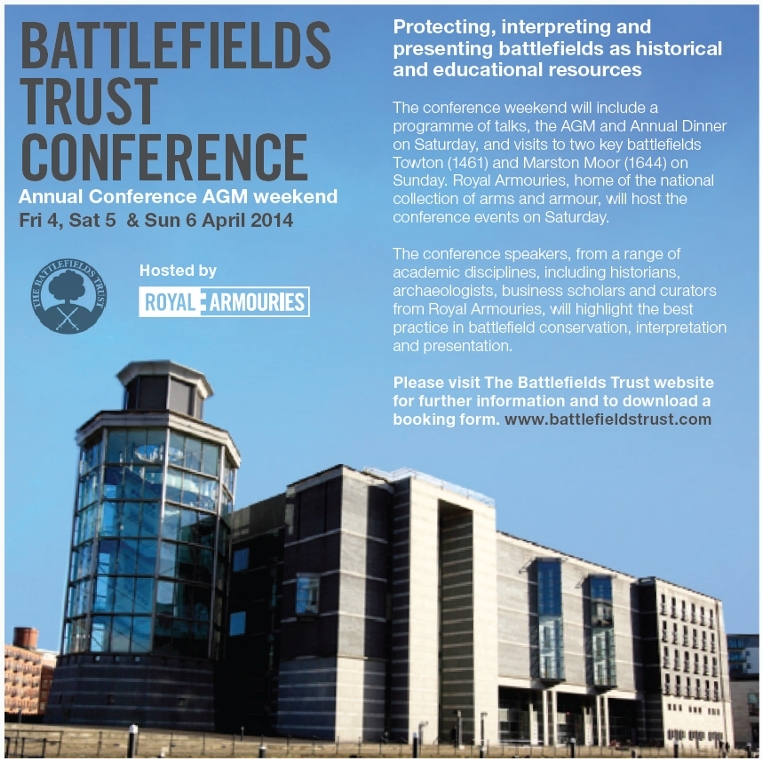 SATURDAY 5TH APRIL 204: JOINT CONFERENCE BETWEEN THE BATTLEFIELDS TRUST AND THE ROYAL ARMOURIES (BURY THEATRE, ROYAL ARMOURIES, ARMOURIES DRIVE, LEEDS, LS10 1LT) ON BEST PRACTICE IN BATTLEFIELD CONSERVATION, TO BE FOLLOWED BY THE BATTLEFIELDS TRUST担 ANNUAL GENERAL MEETING. Entry to the Royal Armouries itself is from 10 am and is free. 10.00am: arrival, registration and coffee. 10.15am ・ 10.45am: Introduction and Welcome from Dr Edward Impey, Director of the Royal Armouries and Scene Setting by Frank Baldwin, Chairman of the Battlefields Trust. 10.45am ・ 11.30am: Speaker from the Bosworth Visitors Centre/Leicestershire County Council – Bosworth as a Case Study for the Tourism and economic Aspect of Battlefields. 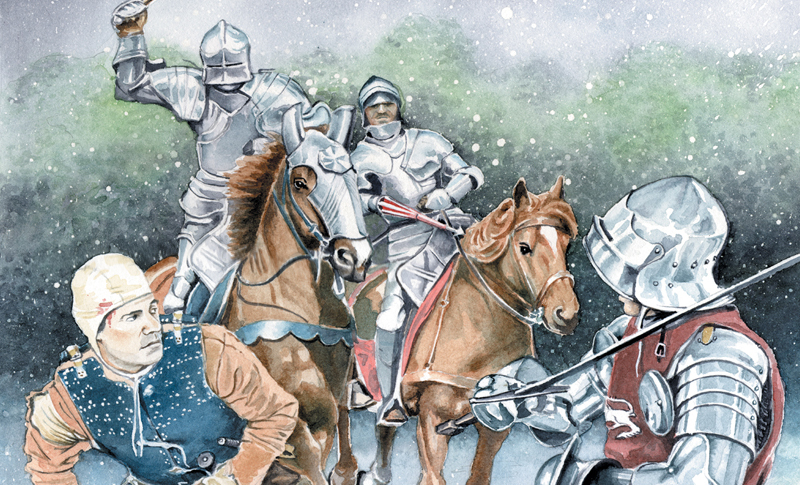 11.30am ・ 12.15pm: Dr Karen Watts, Senior Curator of Armour and Art at the Royal Armouries, The Battle of Agincourt: new perspectives for the Agincourt 600 Exhibition・. 12.15pm ・ 1.30pm: Lunch and opportunity to tour the Armouries. 1.30pm ・ 2.15pm: Dr Glenn Foard FSA, Reader in Battlefield Archaeology at the University of Huddersfield, [topic to be confirmed]. 2.15pm ・ 3.00pm: Dr Tony Pollard, Senior Lecturer in History/Battlefield Archaeology at the University of Glasgow ・ The Archaeology of the Western Front・. 3.00pm ・ 3.45pm: The Development Officer Project ・ final report (Julian Humphrys). 3.45pm: Closing remarks followed by tea. 4.00pm: BT Annual General Meeting. Non-members are welcome to attend, but may not vote, speak or propose motions. There is a separate agenda for this meeting for Trust members. Anyone joining the Trust on the day will be able to participate as a full member. 9.00 am Depart hotel for Battlefield tour. The dress code for the conference is casual, except for the Battlefields Trust Dinner when we hope that gentlemen would wear a jacket and a battlefields trust tie. Delegates attending the battlefields tours should bring suitable footwear and waterproof clothing. There is a public car park next to the Holiday Inn. The Trust is willing to pay mileage rate for delegates willing to offer spaces in their car to others for the battlefield tours. Will archaeology confirm Crécy (1346) as the first honour title of The Royal Artillery? 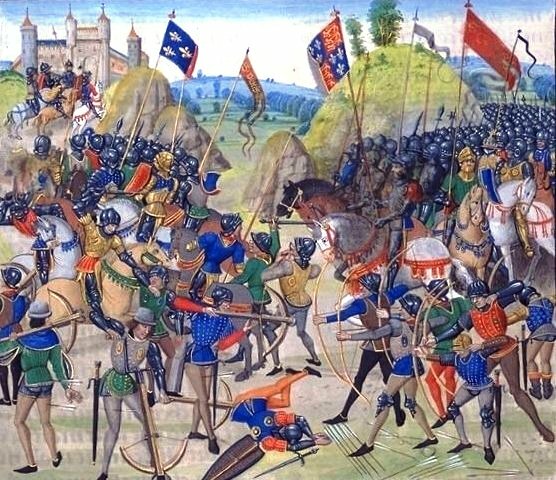 The battle of Crécy (1346), alongside Agincourt (1415) has gone down in history as the triumph of the English foot soldier armed with the longbow over the French Knights. It has been known for a long time that Edward III had four cannons with his army, but their role on the battlefield has been dismissed, as having no effect beyond announcing that fire-power had arrived on the battlefield. However, in a speech to the Battlefields Trust, Professor Michael Prestwich argued that we should re-examine our interpretation of the Battle of Crécy and that Edward III’s cannons had a much bigger impact than as a mere gimmick of alchemy. 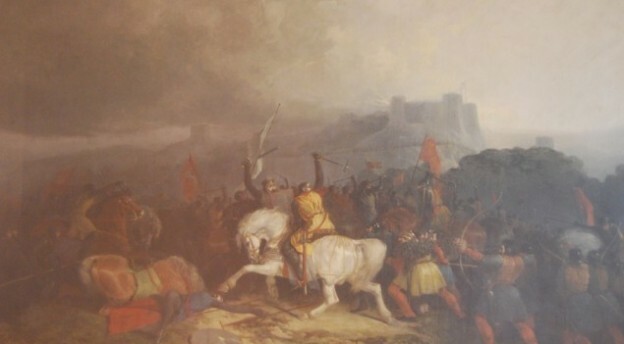 Edward III’s unexpected victory over the French at Crécy-en-Pontieu near Abbeville overturned the presumption that knights would ride down foot soldiers. This established the Longbow as an important weapon, the yeoman archers of England as heroes, and demonstrated the fighting power behind Edward III’s claim to the French throne which started the Hundred Years War. King Edward III landed in Normandy in July. Having captured Caen he moved East to cross the Seine and then headed North along the coast, pursued by a larger French Army under King Philip VI of France. Edward crossed the Somme after winning the Battle of Blanchetaque on August 24. Tired from their marching and fighting the English army encamped near the Forest of Crécy. Philip raced towards Crécy with his men, keen to defeat the English and angry that he had failed to trap them between the Seine and Somme. 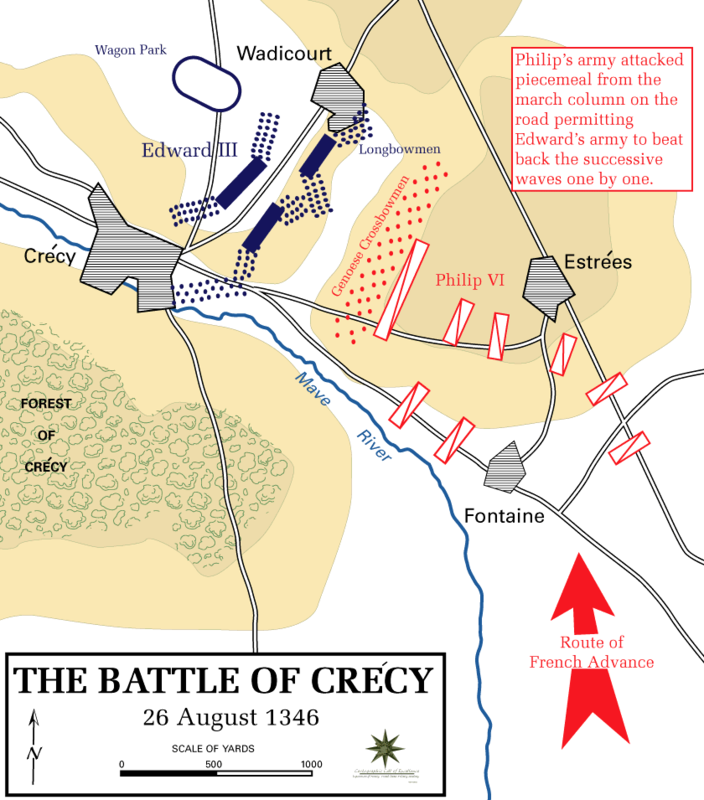 It is generally accepted that Edward deployed his men along a ridge between the villages of Crécy and Wadicourt and divided his army into three divisions. The right division was assigned to his sixteen-year old son Edward, the Black Prince. The left division was led by the Earl of Northampton, while Edward, commanding from a vantage point in a windmill, commanded the reserve. These divisions were comprised of dismounted men at arms supported by large numbers of archers equipped with the English longbow. The English improved their position by digging ditches and laying obstacles in front of their position. The baggage train was in the rear of the English position. Sometimes accounts mention that four cannons were positioned in the front line. The leading parts of Philip’s army, advancing North from Abbeville arrived near the English around mid-day on August 26. The French started the battle before the whole French army had arrived on the battlefield. The French advance was led by several thousand mercenary Genoese crossbowmen, followed by thousands of French knights organised into divisions under the leading nobles, while King Philip commanded the rearguard. When the Genoese crossbowmen approached close enough they fired a series of volleys at the English. These proved ineffective compared to the English response which was devastated the Genoese and forced them to retreat. This in turn provoked some French Knights to cut down the retreating Genoese as for their cowardice. The failure of the Genoese is attributed to several factors. A brief thunderstorm before the battle had wet their bowstrings. The decision to start the battle early, meant that they fought without their pavise’s wooden shields behind which they could shelter while reloading. Also, the rate of fire of a longbow was far in excess of a crossbow, with a longbow-man loosing thre or four arrows to each crosw-bow bolt. The French knights fell into confusion as they collided with the retreating Genoese. Continuing the attack, the French knights were forced to negotiate the slope of the ridge and the man-made obstacles. Cut down in large numbers by the archers, the felled knights and their horses blocked the advance of those to the rear. At some point in the battle Edward received a message from his son requesting assistance. This King Edward refused, stating “I am confident he will repel the enemy without my help,” and “Let the boy win his spurs.” As evening approached the English still held their position after repelling sixteen French charges, and felling their attackers with arrows. This was a huge English victory. But, this interpretation is based on conflicting and fragmentary sources surviving from medieval records. Michael Prestwich pointed out the accepted interpretation is largely based on a selective choice about which sources to accept and which to reject. Even the location is uncertain. Geoffrey le Baker, refers to the field of Crecy, while Froissart writes that battle took place near a wood, somewhere between Crécy and La Broie, (five miles apart) and the king was on the mound of a windmill, at the rear of his army. While another source, Henry Knighton mentions another place name, Westglyse, identified as Watteglise, which is to the north-east. 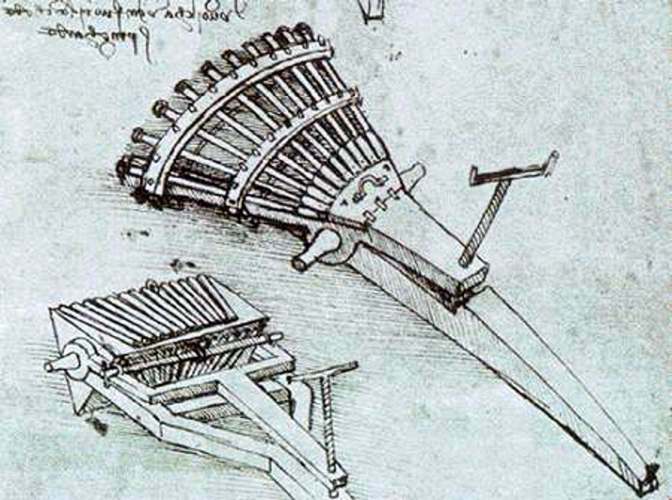 These Italian accounts are usually discredited because it is hard to reconcile the accounts of the carts with known practices of the time. But perhaps the Genoese were describing something they had not seen before and could not understand. What they may have been looking at is the vehicles needed to support a gun battery – the worlds first wagon lines. Guns need a lot of vehicles, to transport the pieces, protect the ready use ammunition from the elements, carry ammunition and all the services to support the men who serve the guns. Edwards battery may have needed the ability to cast or carve their own shot, carry and possibly manufacture gunpowder. Edward’s army was on the move. It had prepared to fight at Crecy and it may have made sense to retain the ammunition and stores needed for the guns close by rather than banishing them to the baggage train. As artillery evolved all the vehicles were held in the wagon lines where they would be protected from enemy fire. But at Crecy there was no enemy artillery fire, and contrary to Hollywood, flaming arrows were not a normal medieval battlefield weapon. A separate wagon lines would be additional risks to an English army marching through hostile territory and faced with a superior mounted enemy. And the wagons and carts might also have provided cover for archers. Edward’s army may have been accompanied by more than the four bombards. According to Michael Prestwich, Edward had ordered 100 small guns, known as ribalds, in October 1345. These had, it seems, wheeled carriages, and were probably multi-barrelled. 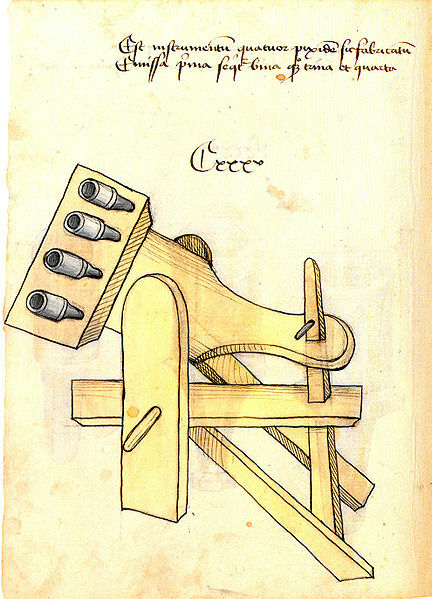 So maybe the battle of Crecy was the worlds first battle where artillery played a significant part in the battle. So far this is a bit of speculation based on an after dinner speech by an eminent historian and information sources hiding in plain sight on the Internet. 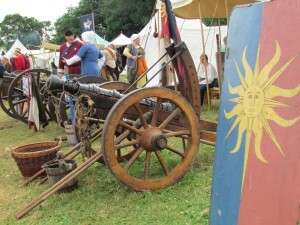 But the early gunpowder era is interesting for lots of reasons, not least because modern archaeological techniques have been able to establish new facts about medieval battlefields from the evidence that gunpowder weapons leave. In the last couple of years Glenn Foard rediscovered the battlefield of Bosworth from the cannon balls. Perhaps it is time to start a project to search for cannon balls from Crecy that may have sunk in the wet soil. King Louis the First of England! Prince Louis of France was invited by the rebel barons to become king of England following King John’s refusal to accept the Magna Carta he had sealed at Runnymede. Over 200 castles in England were besieged, by the rebel barons or King John’s forces, in what became the First Barons’ War. This aimed to safeguard the rights, privileges and liberties of the clergy and the nobles as enshrined in the Magna Carta, but spilt out into a dynastic war for the English throne. This was only settled with the death of King John, and his succession by King Henry III. Even then, the dispute continued until the end of the century. There were dozens of battles and sieges between 1214 and 1267. This was an era of castles and sieges. Many of the castles still stand. At Rochester you can still see the damage caused by John’s army when it undermined the corner of the keep using the fat of 40 pigs to create a fire fierce enough to burn the props. These are events populated by heroes, heroines and villains that could have been created by Hollywood. There are princes fighting for their kingdom, wicked sherriffs, heroines, callous mercenaries, treacherous pirates and outlaws. A summary of the main military events are here. The Battlefields Trust is planning to create a Battlefield Trail covering the battles and sieges of the barons wars. This will be a major project and be timed to coincide with the 800th anniversary of Magna Carta as well as the 750th Anniversary of the Siege of Lewes. The Battlefields Trust is a member of Magna Carta 800. One of the most exciting developments is the inclusion of battlefields in the Magna Carta 800 Trail being developed for Vist England. This is the first time it has been possible to promote Britain’s Battlefield heritage as part of a tourism strategy. 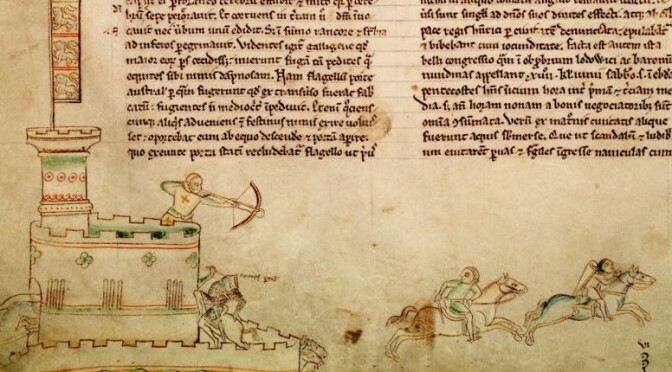 In his talk Julian Humphrys will focus on three key episodes in the Magna Carta War: King John’s dramatic capture of Rochester in 1215, Hubert de Burgh’s stubborn defence of Dover in 1216 and William Marshall’s crushing defeat of the French at Lincoln in 1217. British Battlefields has been set up to promote and organise visits to British military heritage. It will be offering battlefield tours to the battlefields of Magna Carta.